Becoming a new parent can be a challenging experience, especially when taking into consideration the sheer amount of necessities that a new baby needs. One aspect that every new mom considers troublesome is choosing what sort of bottle sterilizer is needed in order to ensure the safety of the baby. With several options of bottle sterilizer laid before our eyes each with its own built or model, it all depends upon what sort of bottle sterilizer will work best for oneself. The below key facts must be taken into account when buying a bottle sterilizer for your baby online. 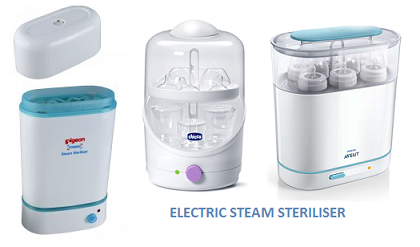 Electric Steam steriliser operates in a pretty easy method by ensuring that the feeding bottle used is free from any form of germs by allowing the device to sterilize about three to four bottles that has been inserted around the hooks in the sterilizer through the use of steam. You can find these types of feeding bottle sterilizers from suppliers like Big Chemist which are said to be one of the best electric steam steriliser for most baby bottles. However, one drawback behind utilizing this particular type of sterilizer is that it is somewhat limited in the amount of bottles that can be placed within the device. Not only that, properly sterilizing a bottle can take up to 30 minutes or more given the settings used on the device. If you are in a hurry and need a sterile bottle immediately, this is not the sort of sterilizer that you should get. On the other end of the spectrum are the larger counter top sterilizers that can fit up 8 or 9 bottles at a time depending on the type of model chosen. These are definitely far different than their electric counter parts as they have no electric parts to speak of. This model works by placing the baby bottles within a series of holes that dangle over the middle of a pot. The bottom part of the pot is filled with water up to a certain point. Then, the pot is placed over a counter top oven by placing a lid to cover the top and then the stove is turned on for heating the pot. It works under the same principles as the electronic steamer but here instead of electricity it is the heat from the stove that creates the steam which helps to sterilize the bottles. Now taking into account the economic means of strelizing baby bottles through the old means of using counter top boiler, the one drawback it has compared to an electric steamer is its portability as its main requirement is the usage of stove. So, it is recommended that most families can get the best of both wherein the former can be used for home while the latter can be used for travelling purposes. The important difference between branded and unknown brand baby bottle sterilizers is the risk involved in finding on what materials are the feeding bottles made up of. There are chances that any potentially hazardous materials in fake bottles to leak into the contents of the bottles when exposed to high temperatures. According to theSoftLanding, there had been various complaints sent against China in 2013 wherein it was accused of product dumping by selling baby care products that contained lead additives that were potentially toxic to infants if the counter top sterilizers were used. Also, there are high chances that electric baby bottle sterilizers that are from relatively unknown brands either not being properly vetted or not been examined by the proper safety agencies posing serious health complications to exposed children due to potentially harmful set of chemicals in the future. Hence, it becomes necessary to buy baby bottle sterilizer from a well-known brand for our baby's safety. As a parent, it is our responsibility to buy products that is safe for our children to use. Getting the right type of sterilizer can make a huge difference during this period of time in a child's life where it is very likely that they can get sick due to their underdeveloped immune systems. With all these in mind, one must make sure that you buy products that have been properly examined and vetted by government safety agencies so that you can be assured of your baby's safety. So many things to be arranged and so many choices..its crazy! Nice post dear.